American IPA hopped with varietals rich with tropical flavors. Sierra Nevada brewers used the legendary Hop Torpedo to infuse fruit-forward hop flavor with lush orange blossom and passion fruit aromas to paint the perfect picture of island life. 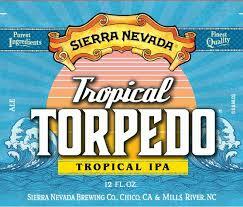 This tropical twist on Torpedo IPA is sure to awaken your senses and reward your palate with bright, juicy flavor. This great beer uses Citra, Mosaic and El Dorado hops to create bright fruit-forward flavors of mango, papaya and bitter orange.